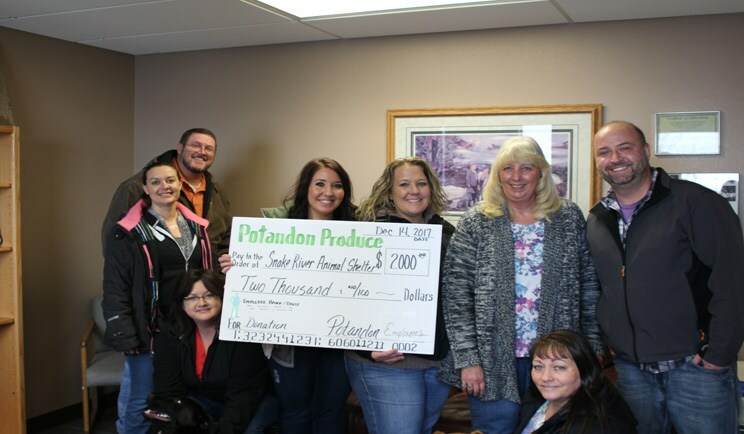 Potandon's employee's were able to raise $2000.00 this year to donate to the Snake River Animal Shelter! Employees were able to double last years donation by making and selling breakfast burritos! Potandon's very own Brandi Boot spear headed the effort to raise money to support the Snake River Animal Shelter. Through the sales of cookies, breakfast burritos and biscuits and gravy, Potandon employees raised $1,000.00 for the shelter. During the month of November, Potandon held a food drive to help stock the local foodbanks for the winter season. The goal was 500 cans/boxes of food to deliver to the foodbank on Dec 2nd. The awesome employees at Potandon not only meet that goal but went above and beyond and donated 528 cans/boxes of food. Robert Sorenson stopped by the Potandon office on November 30th. 2016 to present Stephanie Bench and the Sysco team the Silver Sponsorship award from Sysco for outstanding customer service and commitment to quality.